This month’s Pro is Kate Hodgkinson, Marketing Assistant Intern at OnYourMark, LLC. Kate offers tips for incorporating blogging into your marketing. 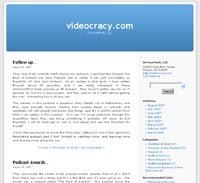 Our blog at Videocracy highlights industry trends, new video services at OnYourMark and personal anecdotes from our videographer. The term BLOG is derived from “web log” which is viewed by many as an online journal. These days, it is usually more time efficient to type one’s thoughts rather than taking the time to write them down. Log in, type, post: that’s all it takes. Did you ever stop to consider the benefit of blogging as a marketing tool? The ease of logging in, typing and posting could be applied to your business’ marketing plan to return great results. Did you know there are people today who get paid JUST to blog? Using a blog as a marketing resource has the potential to set off a chain of important events. 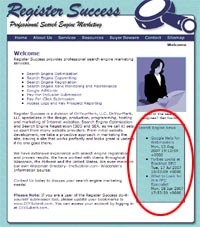 By using a blog that is rich in keywords, it can be found through search engines. When reading your blog, potential customers should not feel pressured to buy. Your blog should be somewhat informal, as if they were reading a post from a friend. Make viewers comfortable with your company by helping them feel like they’re reading something that wasn’t copied and pasted from a company brochure. Your blog MUST have great content. You want them to read all of it rather than skim through it quickly, don’t you? Intrigue them – give them enough information to make them curious enough to click on that link to your website. At this point, whether they buy or do not buy, your marketing has proved successful in getting potential customers to your website. Tip from Keith Klein, Author of WebForging: Great selling means making it easy for buyers to buy from you. Recent blog posts are featured on the Register Successhomepage, adding current content to the site. With your blog increasing traffic to your website, there is now the potential to increase sales. Make sure your website is updated and doing its job! They’ve clicked on your website link for more information, so be sure the information they’re looking for is available and as easily accessible as the blog was. Writing one good blog isn’t enough. A key factor to blogging is constantly updating. In order to build credibility you need to appear committed. Do you have a new product you’re excited about? Do you have upcoming events? Blog it! Make your blog one that people will come back to and read. Establish yourself in the blogging community. If readers post comments or responses to your blog, answer them and let them know they’ve been heard. This gives you bonus points in the customer service spectrum. Not only can your blog drive web traffic to your site and establish your company name, but a good blog opens the doors for “viral marketing” as well. First, you gain the benefit of free (or inexpensive) marketing through your blog, and then you gain the benefit of completely free marketing through blog readers! Friends or colleagues are discussing something related to your company, someone has read and been impressed by your blog, and they speak up. A customer, or potential customer, has just expanded your audience at no cost to you. Write your blogs in your own distinct voice – Sound like a human, not a machine. Update it constantly – Respond to comments from readers, keep them up to date with new occurrences, check in to reiterate your message. Make sure they’re rich in keywords – Identify your target market and think of terms they would search for. This will ensure you’re getting the right people to your blog. For more info, be sure to check out OnYourMark, LLC’s blogging resources! Previous Post Ask The Pro: Where can I get images for my website? Next Post Ask The Pro: What are the do’s and don’ts of corporate videos?